Florida Chicks-When can I put them outside??? Discussion in 'Raising Baby Chicks' started by Ellagrace, Aug 13, 2010. I live in Florida. It is 79-85 at night and 89-95 during the day. It is warmer outside than in my house - that is where my chicks are now, in my house. When do you think I can but my chicks outside? My chicks now are 2 1/2 weeks old now. The coop will be done this weekend. The coop is weather proof for the rain/nights and I can open everything during the day when it is hot. I will love all input please!!!! p.s. my chicks are starting to fly out of my boarder and roosting on the feeder and watering dish. The boarder is over 2 feet high!!! I'm in TN but I'm familiar with FL weather...I moved here from there in Dec of 2008. This year many days it is hotter here than in FL...my mom still lives there and we talk frequently. Given the weather here this is what I do with chicks. I have two incubators, and move eggs on day 16-18 into a hatching incubator which is identical, but without a turner. When they hatch they go into a tub in the house where they stay a week. I use a heat lamp only in the house and turn it on only when they complain. If they are cold, they will let you know. Then they go out in a broody pen in the coop that they can't get out of. Usually they are in batches of ten to fifteen chicks. After a week I open that up (it is floor level) and they will roam in the coop. At this point they are in with the general population. Within a few days of that they are venturing outside through the big door left open in the day time. I've never lost a chick doing it like this except those chicks that were not doing well at hatch time....I've lost about a third of those I 'helped'. I've lost more that were hatched by hens who are kept separate in 3 x 6 foot outside pens with fencing that chicks can't fit through. Last week...overnight...I lost two. One under each of two hens kept in pens right next to one another. Both chicks were found dead in the morning in the nest boxes where they spent the night under the mother. One looked squashed looking. I suspect the heat...no one else got sick, or died from those hatches. Recently I did a head count and discovered some missing teenaged chickens. I'm surrounded by thousands of acres of woods and all the chickens will go in them. I suspect predators got those half-grown chicks somewhere in the woods. I've never lost a chick or a chicken to a predator and I keep most of my about six dozen chickens in outside covered pens during spring, summer, and fall. Overall I lose less then ten percent of them for any reason. That is acceptable for me. They free range and go into the woods most days, all day long. I live in a very rural area. When I cage them (so that they will not cross breed) I notice a dramatic increase in the amount of feed I have to give them. So...I break most of the rules but the results are 'good enough' for me. In the summer...weather permitting...my chicks go into the general population when they are two weeks old after spending a week caged but in the coop with everyone else. 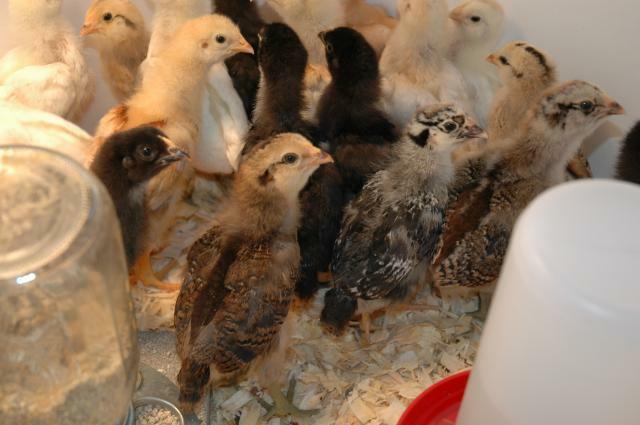 Chicks are fully feathered out at 4 to 5 weeks old. After that, you really don't have to worry. If it never gets below 79 and they are not in a draft, they can go out now and they will do fine. Be careful if you get lucky enough to get a rainy night where it cools off more than expected. I'm in central Texas, lows in the upper 70s lower 80s, highs in the lower 100s right now. I have chicks in the house also and want to move them outside. My concern is that it is too hot out there for them. They have shade, of course, and the pen has grass and a good breeze. It still makes me nervous because of the heat. However, I think they would be much happier out there. I plan to move them out this afternoon. I'll turn on a sprinkler to help cool the grass and that should make a difference. I say put your chicks outside where they'll be happier. It's warm enough for them. I agree with lovinlife, it sounds like the temperatures are good to put the chicks outside as long as they're protected from predators and have some shade. Have fun! Here in Central Florida, this is what I do in the summer. In the 1st couple of days, I put the chicks on grass for about 1 hour. They don't go very far and I sit with them. I keep increasing their time outside. At 1 week, I put them in the coop, isolated from the other chickens. Towards evening time, I gather them up and bring them back inside at night. At two weeks, they are on their own. Because of numerous hawks, I normally do not let them free range for a month or so. Also, I MAY put out a light for a few days/week depending on the circumstances. I don't know if my way is correct, but I despise seeing the little chicks penned up. I take more of a old timer approach. I live outside of downtown orlando. During summer it does not get under 70 at night. When I lived up north, there would be chicks in the barn year round with only their mom. With the weather taken into concideration, I have my chicks outside from day one. I make sure their coop is breeze proof and put into a proteted part of my yard. They huddle together just like the big girls. I have never had one die due to exposure. If they are kept dry they can handle some cooler temps. I have heard that you must keep the brooder at 95 on first day, 90 on second, and so on. In the winter up north, a broody hen is not that warm. I live in Orlando and we put our chicks outside at 5 weeks of age, it was the end of July. They have a covered run and did not free range until the last couple of weeks because we have a pair of red-shouldered hawks that live close to the lake. I am in Jacksonville. Mine are going out tomorrow. They hatched Aug 2. Yours are a little more feathered out than mine. It is definately warm enough here in JAX. I do put a red little solar light in the brooder with them at night. My last batch, I had to worry about keeping them cool it was so hot at night and during the day. They went out at 2 weeks and they were fine. They grow up super fast!